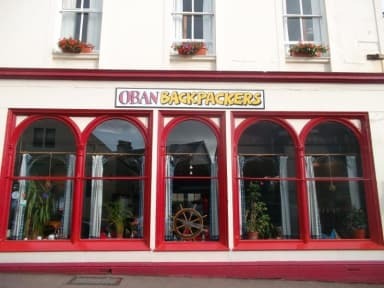 Whether you’re passing through Oban on the way to the Islands, or staying for a couple of days and exploring historic and beautiful Argyll, the original Oban Backpackers is the place for you! 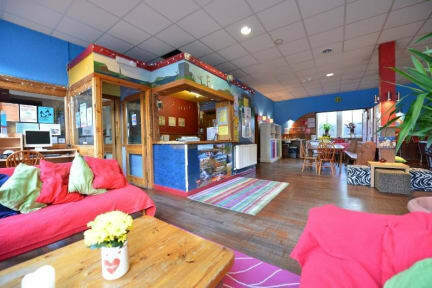 Our funky hostel is part of the World famous ‘Scotland’s Top Hostels’ chain and we look forward to welcoming you to Oban. As our accommodation is comprised of dorm rooms, we can only accept families with children if the whole room has been booked for sole occupancy. We CANNOT accommodate guests under the age of 18 in dorm rooms with other guests. If any guest within your booking is under the age of 18 you MUST contact us directly before making the reservation online. Translated from its Gaelic tongue to mean ‘small bay’, Oban is an idyllic horseshoe bay sheltered from the Atlantic by the isle of Kerrera. Also known as the ‘Gateway to the Isles’, this is the largest port in North West Scotland and boasts spectacular views across to the Hebridean islands. In particular, the view at dusk from McCaig’s Tower provides a sunset you are unlikely to forget. Like any small port, there is a lot going on in Oban; the bustle of fishing boats, ferries, yachts and sea birds make the waterfront a lovely place to be. The Original Oban Backpackers is perfectly located to enable you to make the most of your time in Oban. Just a 10 minute stroll from the bus, train and ferry terminals, our friendly hostel has everything you will need after a great day out exploring. Our spacious, bright dorm rooms have all been recently refurbished and offer wide comfy beds that come complete with fitted sheets, duvets and 2 comfy pillows. Our powerful hot showers are available 24 hours and are guaranteed to leaving you feeling refreshed and ready for your next adventure. We have a fully equipped self-catering kitchen that has everything you will need to cook your favourite meal and plenty of storage space and fridges available for you to use. We serve an optional breakfast of cereal, toast, fruit juice and a freshly baked Scottish scone. You can have a 'wee bit of everything' for just £2.00 or simply prepare your own. The choice is yours! Our funky living room boasts plenty of comfy sofas, a pool table, a fabulous real coal fire, loads of useful local information, games, free WiFi, an Internet Café Style computer and as much free tea, coffee & hot chocolate as you can drink! It’s a great place to relax and meet like-minded travellers so what are you waiting for? Our staff are a friendly bunch who know the local area like the backs of their hands so don’t hesitate to pick their brains when you are planning your Oban adventure. Always a pleasure to stay here. Have done countless times before and definitely will do again. Can't fault the place. Had a lot of fun at the ceilidh and getting picked up at the hostel by the bagpipe player. Was very well looked after, a quiet time but staff still made the effort to dress up for Halloween. I enjoyed my stay and would recommend the hostel to friends. A great hostel. Staff and people were friendly and welcoming. A nice common place to socialize if you want to. A good kitchen well equipped so you could cook any meal. Confy bed. I would chose this hostel if I was go back to Oban. Very lovely common area, I found everyone to be really friendly. The place was clean and beds comfortable! We were able to use the common space before the check in time of 5 which was really appreciated, made the place feel a little like home! A comfortable bed in a spacious dormitory. A few more hooks for hanging stuff up might be useful. Very nice stay. Great hostel! Wonderful staff and vibe! Only negative is the lack of secure luggage storage! I'd give this place 10 out of 10 otherwise! Great for a night or 2 , the commom room is really nice and the localisation also within the city. Reception not so friendly. We stayed in a 6 bed mixed dorm. There was a single outlet in the room near the door that was already being used, all other outlets were in the hallway or downstairs in the lobby. The WiFi was not great and only picked up downstairs in the lobby. The room smelled like urine. The cots did not even feel padded. The bathrooms werent clean & very small. There are no lockers to lock up your stuff, we kept our valuables locked in the car. Overall, one of the worst hostel experiences I’ve had.